An ECN is a type of computerized forum or network that facilitates the trading of financial products outside the traditional Stock Exchange. An ECN, generally speaking, also serves as an electronic system that widely disseminates orders entered by market makers to third parties and permits the orders to be executed again in whole or in part. The term ECN was adopted by the SEC and is defined as, “any electronic system that widely disseminates to third parties orders entered therein by an exchange market maker or OTC market maker, and permits such orders to be executed against in whole or in part”. The first ECN, the Instinet, was released in 1967 and provided an early application of the advances in computing. ECN’s are also sometimes referred to as alternative trading systems or alternative trading networks. Primary products traded on ECN’s are stocks and currencies. ECN’s increase competition among trading firms by lowering transaction costs, giving clients full access to their order books, and offering order matching outside of traditional exchange hours. To trade with an ECN you must have an account with a broker that provides direct access trading. An ECN matches the contra side order i.e. sell order side is contra-side buy order side with the same price and share count for execution. The ECN will post unmatched orders on the system for other subscribers to view. Generally, the buyer and seller are anonymous, with the trade execution reports listing the ECN as the party. The first ECN used for internet currency trading was New-York based Matchbook FX formed in 1999. At that time, all the prices were created & supplied by Matchbook FX’s traders/users, including banks, within its ECN network. Today, multiple FX ECN’s provide access to an electronic trading network supplied with streaming quotes from top tier banks all over the world. Their matching engines perform limit checks and match orders with speeds of less than 100 milliseconds per order. The matching is quote driven and these are the prices that match against all orders. Spreads are discretionary but, in general, multi-bank competition creates one to two pip spreads on USD Majors and Euro Crosses. The order book is not a routing system that sends orders to individual market makers. Rather, it is a live exchange type book working against the best bid/offer of all quotes. Classic: The classic structure tends to attract liquidity removers. Credit (rebate): appeals to liquidity providers. In a credit structure, ECN’s make a profit from paying liquidity providers a credit while charging a debit to liquidity removers. Credits range from $0.002 to $0.00295 per share for liquidity providers, and debits from $0.0025 to $0.003 per share for liquidity removers. The fee can be determined by monthly volume provided and removed, or by a fixed structure. This depends on the ECN. In a classic structure, the ECN will charge a small fee to all market participants using their network, both liquidity providers and removers. They also can attract volume to their networks by giving lower prices to large liquidity providers. Fees for ECN’s that operate under a classic structure range from $0 to $0.0015, or even higher depending on each ECN. In the past, many ECN’s were “closed book”—i.e., allowing participants to interact only with other participants in that network. 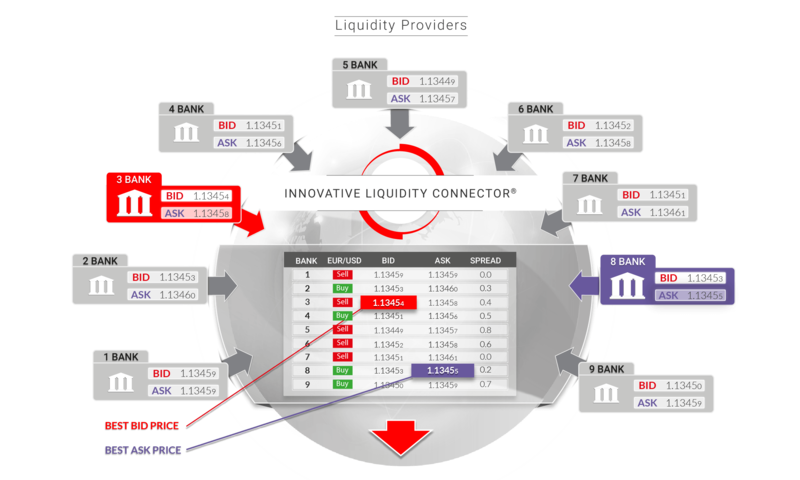 However, ECN’s have increasingly adopted an “open book” format, addressing the potential fragmented liquidity by integrating orders with those of other ECN’s or market makers, thus increasing the overall pool of orders. Tradeview offers a multitude of ECN’s that connect to multiple top-tier banks and liquidity providers that give our clients direct access to the best trading conditions in the world.